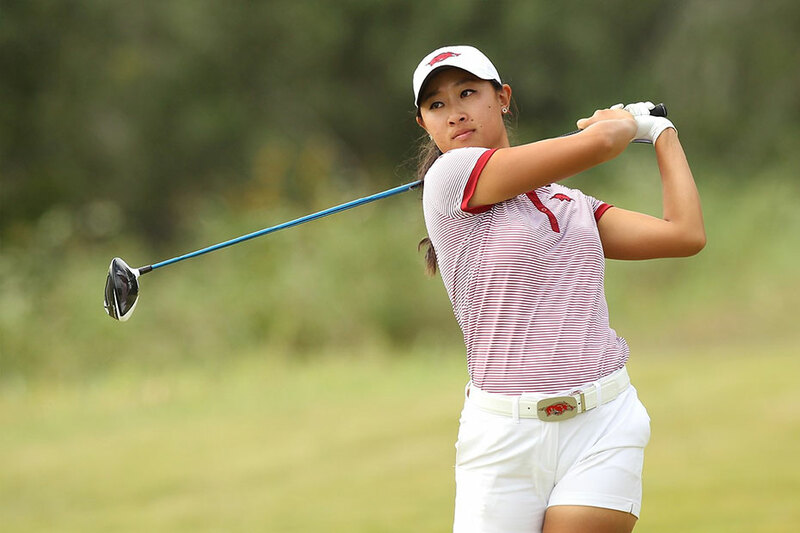 ATHENS, Ga. – University of Arkansas junior Dylan Kim tied her career-best with a final round 68 leading the No. 3 Razorbacks to a runner-up finish at the Liz Murphey Collegiate Classic in Athens, Georgia, on Saturday. Kim’s tie for ninth place overall is her fifth top-10 finish as a Razorback and it is the first time she has been Arkansas’ low finisher. Kim’s round helped Arkansas tie for second place shooting a one-over 865 (290–284–291). Top-ranked Alabama won the event finishing 15-under with an 849. Arkansas tied No. 5 Duke in the second-place spot. Host Georgia made a late charge on their home course and was just one of three teams to shoot under par in the final round. The Bulldogs were six shots back with an 871. Kim’s final round 68 was simply solid golf. She opened with six consecutive par holes before finishing birdie-bogey-birdie at the turn. Kim picked up three more birdies, including on the final hole, to finish 1-under. She counted rounds of 73–74–68—215. Senior Alana Uriell (73–70–74) and junior Maria Fassi (73–72–72) tied for 12th place with 1-over 217s. Junior Kaylee Benton tied for 17th shooting 219 (71–71–77) followed by freshman Maria Hoyos who tied for 38th with a 228 (77–71–80) in her fourth collegiate event. Junior Cara Gorlei wrapped up the tournament in 37th place with an 11-over 227 (74–78–75) competing as an individual. The event is the final regular season tournament for Arkansas. The team will remain on the road traveling to Birmingham, Alabama, for the Southeastern Conference Championship at Greystone Golf and Country Club. The SEC Championship features a format change to mirror the NCAA Championship with three rounds of stroke play and two days of match play action beginning April 18. • Arkansas won five of eight regular season tournaments, had two runner-up finishes and one fourth-place finish. • Maria Fassi won five individual titles. • The Razorbacks played the four fall events 92-under par; They are 67-under par in eight events. • Maria Fassi has been Arkansas’ low finisher in six events with Alana Uriell and Dylan Kim leading the Razorbacks in the other two regular season competitions.